(July 10th, 2018) “Delta Green” is Arc Dream Publishing’s ENnie and Origins award-winning role-playing game of conspiracy and cosmic terror. Their “Delta Green: The Labyrinth” Kickstarter, funded in just a day, takes Delta Green agents beyond the beltway and deep into the fissures of America in the new millennium. From Silicon Valley startups to industrialist Super-PACs, from Oregon anarchist collectives to alt-right activists, from the depths of Reddit to this morning’s livestreams, American life has entered a labyrinth of twisty passages all alike. And while there are many ways in, there is no way out. Intrigued? 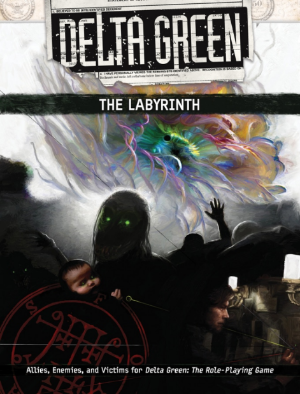 Find “Delta Green: The Labyrinth” at Kickstarter.com before July 31st. “The Labyrinth” will be published in full-color hardback in summer 2019. This all-new collection of organizations presents ready-made sources of allies, enemies, mysteries, and surprises for your Delta Green campaign. Each group has its own story arc, progressing through three stages as it encounters Delta Green agents and the evils they fight. Some groups corrode, wither, and die. Others gain hideous strength and uncover profound new horrors. Each has connections to other groups, ensuring that players find fresh hells at every turn. But all are destined to change — and the journey each one takes holds up a mirror to the agents themselves. The center cannot hold. And once you enter the Labyrinth, you will never escape. “Delta Green: The Role-Playing Game” is shipping to hobby retailers worldwide as of July 2018, supported by a long line of scenarios and resources from the consumer to the retail level.